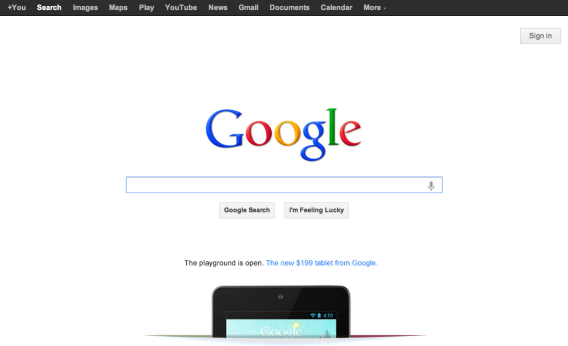 Google puts Nexus 7 ad on homepage, Internet freaks out. Google puts animated banner ad on its homepage. Internet freaks out. There’s a new animation on Google’s home page today, and it isn’t a doodle. It’s an ad. In (something of) a break with tradition, the company is using its main search page to promote its Nexus 7 tablet, which it is hawking for $199. When you go to www.google.com, you first see the iconic Google logo and search bar with a line of text below it that reads, “The playground is open. The new $199 tablet from Google.” After a beat, an image appears that looks like a rip in the bottom of the screen, and up through it pops a picture of the top of the tablet. Click, and you’re taken to the Google Play Store, where you’re invited to add the device to your digital shopping cart. Contrary to some reports, this isn’t the first time the company has promoted one of its products or services on its famously minimalist home page. AllThingsD’s Liz Gannes recalls a few, including one for the Nexus One phone two years ago and an animated announcement about Google+. There will be no banner ads on the Google homepage or web search results pages. There will not be crazy, flashy, graphical doodads flying and popping up all over the Google site. Ever. You could make the case that the new Nexus ad is, technically, compatible with that pledge. It’s just one ad, after all, and it’s not exactly “all over” the site. Aesthetically, it’s relatively sleek and tasteful, as animated banner ads go. Some users will probably type in their search term and pull up results without even noticing it. So it’s a little hyperbolic to say that Google has jumped the shark. If anything, I’d say the phrase “jump the shark” has jumped the shark. Still, the ad makes it clear that Google is willing to pull out some stops on its core search product in order to gain ground against Apple and Amazon in the consumer-electronics market. And why not? With a record 67-percent market share in search, it doesn’t have to spend much time looking over its shoulder at Bing or Yahoo. Now if Google could only find a way to do to Apple what Apple just did to Samsung. Wait, you say it’s already doing exactly that? This could get interesting.